England is facing significant water supply shortages by 2050 unless rapid action is taken to reduce water use and wastage, the Environment Agency has warned. Their new report says enough water to meet the needs of 20 million people is lost through leakage every day.The abstraction of water from 28% of groundwater bodies in 2017 is unsustainable, the agency says.They will work with others to set up personal water consumption targets.The study, the first major report on water resources in England, says that population growth and climate change are the biggest pressures on a system that is already struggling. In 2016, some 9,500 billion litres of freshwater were abstracted, with 55% of this used by public water companies, and 27% going to the electricity supply industry.But in addition to the 3 billion litres a day that are wasted through leakage, there is a considerable price being paid in terms of the sustainability of these supplies. According to the Environment Agency, extraction of groundwater was not at a sustainable level for 28% of groundwater bodies and up to 18% of surface waters. Which new beaches are safe to swim at this summerAround 77% of chalk streams also failed this measure, with over extraction of water being responsible in a quarter of the streams that were tested. 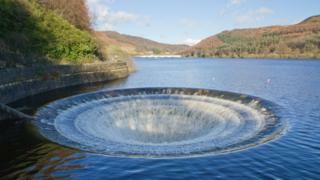 "We need to change our attitudes to water use," said Emma Howard Boyd, the Environment Agency chair. "It is the most fundamental thing needed to ensure a healthy environment, but we are taking too much of it and have to work together to manage this precious resource." Addressing the questions of how much freshwater was being extracted, a spokesman for Water UK said water companies were tackling the issue head-on. "The water industry works hard to protect the environment, and companies will set out ambitious plans later this year which should mean less water is taken out of our rivers," he said. "We've also cut leakage a third since the 1990s, but we know there's a lot more to do - which is why it's one of our top priorities. "The big questions going forward, according to the Environment Agency, are the impacts of climate change and population growth. Rising temperatures will affect the timing and amount of rainfall that flows into rivers and replenishes ground water supplies. Although average summer rainfall is not predicted to change, more rainfall is likely to occur in large downpours in the future, increasing the chances of droughts and floods happening at the same time. The report warns that reduced summer rain and increased evaporation might damage wetland areas. Increased areas of stagnant water during droughts coupled to increased temperatures could see the spread of mosquito-borne diseases such as dengue fever and West Nile virus. The population of England is predicted to increase to 58.5 million by 2026 - the report says that much of this increase is likely to take place in areas where water supplies are already stressed. If no action is taken to reduce use and increase supply of water, "most areas will not meet demand by the 2050s" if both emissions and population growth are high. Even low population growth and modest climate change "suggest significant water supply deficits by the 2050s, particularly in the South East." The government has already suggested that an individual's water use be reduced in their 25-year plan published earlier this year. On average, people use 140 litres every day in England, and the Environment Agency says it will work with government and industry to establish a personal consumption target, and come up with cost-effective measures to meet it. "Industry must innovate and change behaviours in order to reduce demand and cut down on wastage," said Emma Howard Boyd. "And we all have a duty to use water more wisely at home. "The report also highlights the differences that changes to the way we produce energy in England will impact on water supplies. Investment in nuclear power and renewable energy will likely lead to much lower rates of abstraction and consumption by 2050, the study says. However, if future energy scenarios involve carbon capture and storage (CCS), this would require much higher freshwater abstraction and consumption levels, as the technology needs extra water to function, and would also increase the amount of cooling water needed at conventional power plants to which CCS equipment is attached.